Divine Divas Inspiration Challenge #24! Today is the One Year mark for the Divine Diva Inspiration Challenge and Lori is giving away some candy to a participant for this challenge! Just add the link to your project on Lori's blog and you will be entered to win! 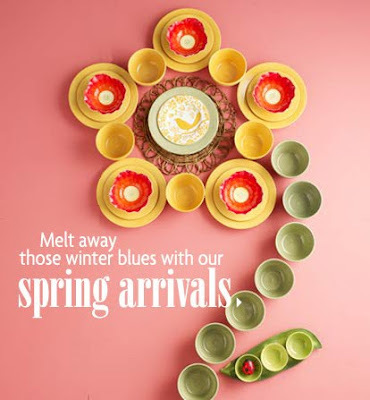 Make sure you check out what the other Divas created and have a wonderful Easter weekend! WOWZA Kerri LOVE LOVE that flower you created, girl you rocked this challenge!!!! Stunning card sweetie, enjoy your day! Kerri, this is really beautiful. Your flower is just stunning with all the layers, and those papers are so gorgeous and cheery! I love it all - wonderful job on the challenge! BEAUTIFUL! And so inspiring! This flower looks just like on the picture! And I really love the colors! :) Amazing take on this challenge! A great card, so beautiful! How yummy that flower is, Kerri!! 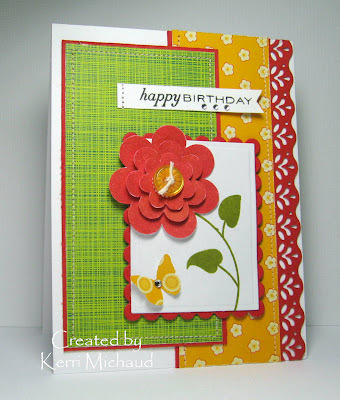 I love that you were inspired to take the shape for your card!! Great use of colors!!! This is AWESOME Kerri!! LOOOOOOOOVE that layered flower!! Wonderful card, Kerri! I love the dimensional flower and your colors really rock! This is gorgeous Kerri!! LOVE the layout and the dimension!! Awesome colors and choice of dp!! Great take on the inspiration! 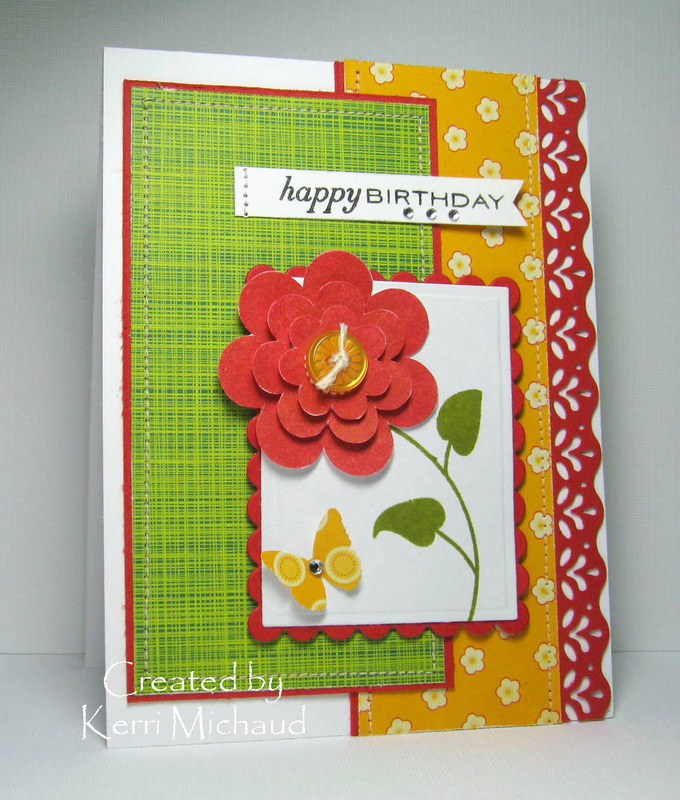 Gorgeous, bright and colourful card. Yup - just like the picture....you do this inspiration stuff perfectly. Love that layered flower topped with the button...and your stitched on sentiment....gonna have to mental rolodex that. I hope you never get sick of me saying how much I love your cards. But you always do something that just makes me swoon. I love the stacked flower and the roughed up edges. I want some springtime flowers here where we live! This is so cheery! I love Pier One! Fabulous card, Kerri! Love the colors! I had an awesome striped patio umbrella a few years ago from Pier One and remembered to go close it as a storm was coming and it was too late. The wind had threw it off our patio and broke it. So, I bought another one and the same darn thing happened! LOL Our current house has a covered back deck, so no patio umbrella is needed!